Looking for a sofa for a small living space? No matter how teeny your living room may be, you are still going to need living room furniture that's comfortable and inviting. Sure, you might have a bit of difficulty squeezing in a full-sized corner sofa into your limited square footage, but lucky for you there are plenty of compact (and still beautiful) sofas out there that would work in a small living space. Check out our favourites for inspiration and choose the best sofa for your room. After a bargain? Check out all the best sofa deals this month in our buyer's guide. Find out more about designing a small living space in our guide, too. Looking for a small sofa but don’t want to compromise on comfort? Hello, Floppy Joe. 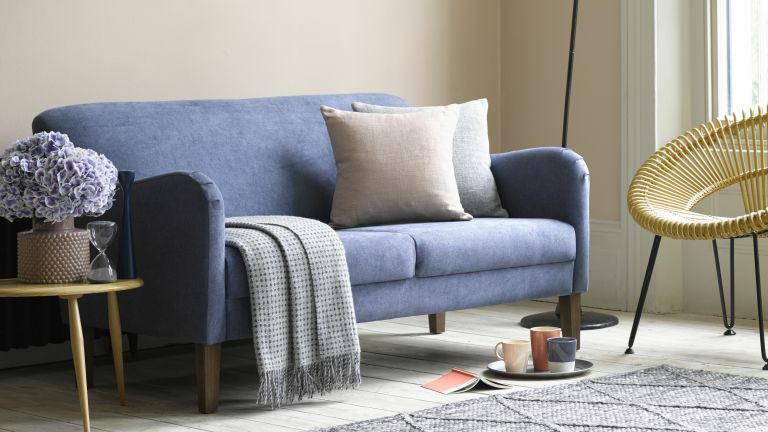 This laid-back sofa came out of a collab between John Lewis and Loaf, and with it’s super soft brushed cotton cover, multiple squishy scatter cushions, feather-wrapped foam seat cushions and modest dimensions what is not to love? Check out more small sofas from John Lewis. Upholstered in Italian leather, with a matt, vintage-style finish, the Dallas sofa from Made.com has soul of retro design with the practicality and comfort of the modern lifestyle. Oh and it’s only 147cm wide... Have a look at more sofas perfect for small living rooms from Made.com. What’s a small space dweller to do when it comes to providing extra beds for overnight guests? While most sofa beds are fairly hefty, the Lennon sofa bed from Perch and Parrow is super compact (only 150cm wide) and we are pretty sure it will squeeze into most small living rooms. Love the look of this sofa? You are going to want to check out our round up of the best yellow sofas. The Lily from sofa.com is ideal if you are working with a small space and doing up a living room on a budget. It has a surprisingly spacious seating area despite its small footprint, due to its pared back shape plus, the fixed seat and back cushions also cut down on excess cushions and give the illusion of size. Have a look at more sofas for under £500. Going for the Mid-century modern vibe in your living room? The simple design and tapered legs the Scott sofa from Perch and Parrow would fit right in. It’s also great for small living rooms as the pared back frame and slim, high legs allow plenty of light to flow around the space. If your prefer a more traditional living room style, the Balmoral two seater from Heal’s has plenty of classic details but is less bulky than a regular Chesterfield. It’s high back and arms give the illusion of it being a much larger model, when in fact it is fairly petite at only 152cm wide. Re-doing your living room on a budget? You don't have to fork out a small fortune for a gorgeous grey sofa. This grey sofa is only £399.99 from Argos ! With its tapered wooden legs and classic saddle arms, we reckon it's a bit of a steal. For more sofas under £500 check out our buying guide and go and have a look at the best grey sofas too.